Moussa Mostafa Moussa, the former presidential candidate and head of the Ghad Party, said he would work to form a national opposition party that would stand by President Abdel Fattah al-Sisi’s side to counter terrorism and to find positive solutions to any problems in the country. The state can not continue with one wing, it needs a genuine opposition to support the state, Moussa added in a phone call on Sunday evening with “90 Minutes” program, broadcast on Al-Mehwar channel. He stressed that the current four-year term of office will be difficult for Sisi because he inaugurated many development projects, that are not in favor of Egypt’s enemies. Moussa told al-Ahram back in March he felt proud of the result of the presidential election, after obtaining an estimated 3 percent of the vote, as he said it showed the true will of the Egyptian people and took place in a democratic and transparent atmosphere. “We all know Sisi’s role and will stand by him to propel Egypt into a new level,” Moussa said. 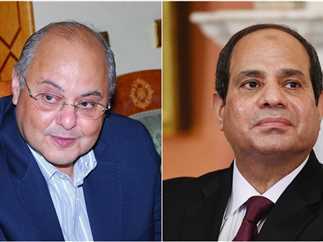 He called the Egyptian people the real winners of the election as they had the opportunity to decide their destiny in the next period under the leadership of Sisi. Moussa claimed that there are still efforts to destroy Egypt despite the failure of all past attempts. He said he will be discussing with the president a new mechanism in which he believes parties should operate under to achieve their real goal of protecting the people, and operate in an effective way rather than merely being a show. Moussa ran for the elections after almost all other candidates have been disqualified or withdrawn. He announced he will be running for president in January and submitted his papers minutes before the deadline. The candidate had previous unwavering support for Sisi throughout the campaigning period before the election.